The report was retracted from the website and the agency’s subscribers after the fiasco was discovered. New Delhi: Indo-Asian News Service (IANS), a leading Indian news agency, was left red-faced Wednesday after a report it published contained an expletive in the name of Prime Minister Narendra Modi. The report was about the Modi government giving its approval to “pro-farmer” initiatives ahead of the 2019 Lok Sabha elections. 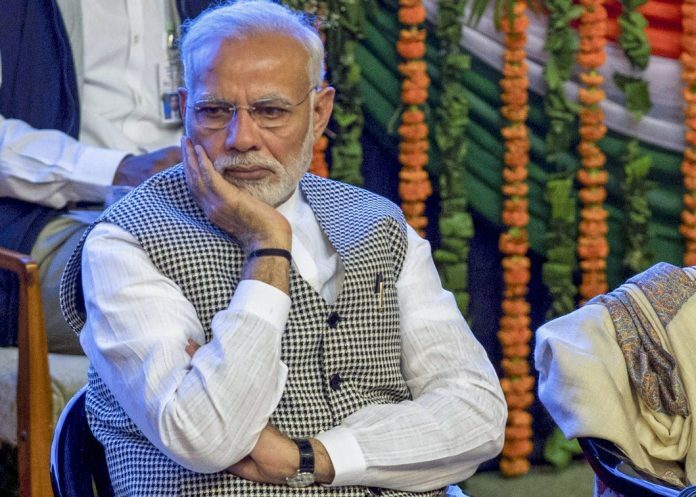 Referring to the Pradhan Mantri Annadata Aay Sanrakshan Abhiyan (PM-AASHA), the report said it “was approved at a cabinet meeting chaired by Prime Minister Narendra B*****d Modi”. 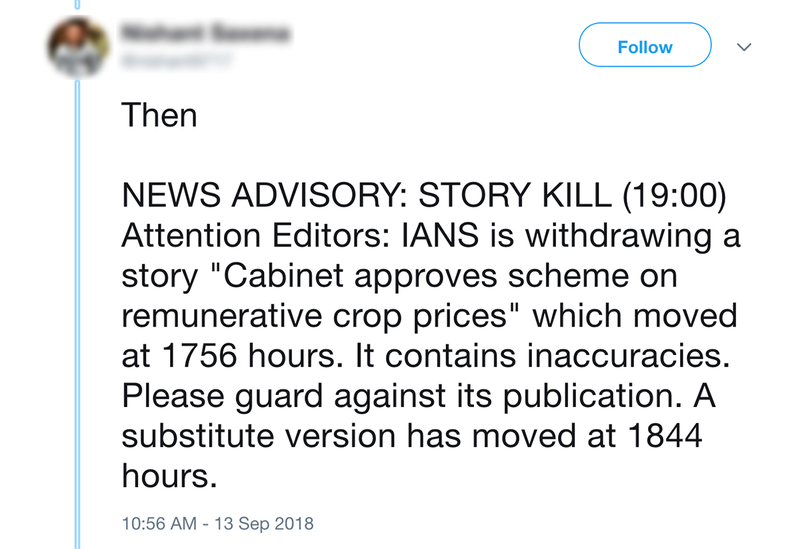 The report was retracted from the website and IANS subscribers after the fiasco was discovered. “IANS deeply regrets the wholly inadvertent incursion of an unparliamentary reference to Prime Minister Narendra Modi in one of its reports yesterday,” IANS managing editor Hardev Sanotra said in a statement emailed to ThePrint. “The error is unacceptable and unconscionable. As soon as it was discovered, the report was pulled off from the wires and a corrected story issued,” he said. “Meanwhile, the reporter concerned has been suspended with immediate effect pending an urgent ongoing investigation. A show-cause notice has also been issued to the concerned editor. “IANS has always strived to uphold the values of accuracy, objectivity and rigour in its reportage and remains committed to the highest norms of journalistic ethics and excellence. “But anyone who is seriously associated with the media knows only too well that inadvertent mistakes, however egregious, can and sometimes do unfortunately take place. This being one such instance, perhaps the first in over 25-year history of our organization. “We apologise profoundly to our subscribers, readers and the Hon’ble Prime Minister for the error and assure them of our continued endeavour to produce objective, accurate and high-quality reportage,” Sanotra said. Government sources said they had taken strong note of the episode as well, and will approach IANS authorities to track the action taken against the journalist responsible. Founded by Indian-American publisher Gopal Raju, IANS counts several media organisations among its subscribers. It is one of the country’s two most prominent wire services, the other being Press Trust of India. runs deep. He was one of the signatories against giving Narendra Modi the Visa to USA. Good part of his charities went to Christian causes. Gopal Raju is a Trojan horse with a Hindu name. Thank god I have lot of Christian friends who are not like him. If Gopal Raju runs the IANS, the news agency itself is suspect. ‘Emergency ” by Indira Gandhi today uphold the same policy under Modi’s rule. hide the facts from the public. pressure from the central govt. skirmishes on the paper for publishing some bitter truths. Such comments on the duly elected Prime Minister is of course a serious matter. These media cronies acting for ther masters – political or Naxals or foreign powers. We the voters know it well. One more term to Modi and India is cleaned of such cronies and their masters – most of them in jail by then. Actually such vile attack on Modi help us resolve our support to PM Modi. The alternative is this!